Here at Diabetes Flashpoints, we’ve periodically covered efforts by health advocates to reduce consumption of soda and other sugary beverages. These proposals have taken a few different forms — from then-Governor David Paterson’s plan to tax sugary beverages in New York State in 2009, to then-Mayor Michael Bloomberg’s plan to limit the size of these beverages in New York City in 2012, to a California proposal to require warning labels on sugary beverages in 2014. All of these plans — and most others across the country with a similar intent — ultimately failed. But last year, the country’s first special tax on sugar-sweetened beverages went into effect in Berkeley, California. As other cities and states weigh similar measures, they may be interested in the effects of the tax on soda consumption in Berkeley — and so far, the tax seems to be doing what its proponents predicted (and hoped) it would. As noted last month in a Los Angeles Times article on the measure, Berkeley implemented a one-cent-per-ounce excise tax on all sugar-sweetened beverages (including those sweetened with high-fructose corn syrup and other forms of sugar) sold in the city. Unlike a sales tax, an excise tax is paid not by the consumer, but by the producer or distributor of a product, so it gets incorporated into the listed price of the item. A study published last year found that in Berkeley, an average of 47% of the tax was passed on to consumers in the form of higher prices, with this number rising to 69% for soda in particular (other taxed beverages include energy drinks, sweetened tea and coffee, and fruit drinks like lemonade). 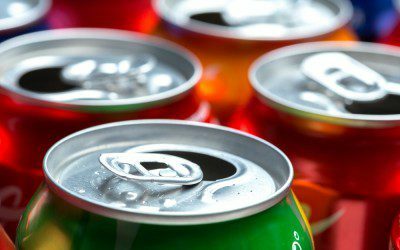 The same researchers conducted a separate study estimating the effects of the Berkeley tax on consumption of sugary beverages, which was recently published in the American Journal of Public Health. As described in the LA Times article, the researchers were interested in the effects of the tax on poor and minority residents, who are statistically more likely to consume sugary beverages. To estimate the effects of the tax, they dispatched interviewers to largely low-income and nonwhite neighborhoods in Berkeley, as well as in neighboring Oakland and San Francisco, where the tax wasn’t in effect. They conducted a total of 2,679 interviews both before and five months after the Berkeley tax went into effect. According to these interviews — after controlling for demographic differences like age, race, and education level — consumption of sugary beverages in Berkeley dropped by 21% after the tax went into effect, including a 36% drop in sports drinks and a 26% drop in regular soda. In comparison, sugary beverage consumption rose by an average of 4% in Oakland and San Francisco during the same period. In certain categories, the difference between the two groups was enormous — in contrast to Berkeley’s 36% drop, Oakland and San Francisco residents increased their consumption of sports drinks by 21%, and while sweetened tea and coffee consumption in Berkeley dropped by 13%, it rose by 22% in Oakland and San Francisco. On the other hand, there was an increased intake of one beverage in Berkeley: water. Its consumption rose by 63%, compared with 19% in the neighboring cities. While this study supports the conclusion that the tax in Berkeley led to a significant decline in consumption of sugary beverages, there are reasons to believe that the effect might not be so large in other cities or states that enact such a tax. Berkeley is a fairly small city, and there was widespread media coverage of the tax and the negative health effects of sugary beverages. This means that many residents could have been deterred from buying sugary beverages not by the price of the items alone, but also by the publicity surrounding the tax. It’s also possible that due to some of Berkeley’s unique characteristics — it’s a university city with a reputation for social and environmental activism — its residents reacted to the tax in a way that residents of other areas wouldn’t. What’s your take on Berkeley’s tax on sugary beverages — do you think that the increase in product prices, or the publicity surrounding the tax, was most likely responsible for the drop in consumption found in the study? Do you think that you, or people you know, would drink less of these beverages if their price went up because of a tax? Do you support the idea of a tax like this, or do you think there are better ways to reduce consumption of sugary beverages? Leave a comment below!